Newly defined follicular regulatory T cells (TFR cells) suppress antibody production. The inhibitory receptor PD-1 has multiple roles on the TFR cell. 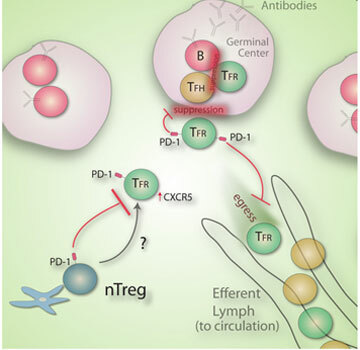 First, it inhibits TFR cell differentiation from natural T regulatory cells (nTreg). Second, it inhibits the suppressive capacity of TFR cells. Third, it prevents the departure of TFR cells from the lymph node into the circulation via the efferent lymph system. Illustration courtesy of the Sharpe Lab. The immune system operates using checks and balances, mounting a defense against invading pathogens, but also beating a retreat when threats recede. The creation of antibodies tailored to counter specific attacks is a hallmark of the adaptive immune response carried out by T cells. Scientists have identified a new subclass of immune cells involved in regulating antibody generation. Now, HMS researchers have taken that discovery further by separating and then manipulating these cells in experiments that suggest how they could be harnessed to improve health. “Understanding how these cells work in different contexts will lead to new types of therapeutic strategies for vaccination and perhaps for treating certain types of autoimmune disease where you have dysregulated antibodies,” said Arlene Sharpe, HMS George Fabyan Professor of Comparative Pathology. Until a decade ago, scientists focused on the generation and promotion of antibodies by immune-system players called helper T cells. Vaccines induce this response, spurring the production of protective antibodies against an invader that cells are “taught” to recognize. In 2000, researchers identified a previously unknown but distinct subset of helper T cells called follicular helper T cells, which also stimulate immune responses and antibody production. But follicular helper T cells have a more recently discovered counterpart in antibody generation: follicular regulatory T cells that inhibit antibody production. This additional layer of immune response regulation has important implications for understanding what leads to the successful generation of an antibody response or to the unbridled and damaging immune response seen in autoimmune diseases such as systemic lupus, rheumatoid arthritis and myasthenia gravis. Only a handful of scientific papers have been published about follicular regulatory T cells. One, from the Sharpe lab, sheds light on this new player in antibody response. The report appears online this week in Nature Immunology. Working in mice, the researchers were the first to show that these cells exist in blood, which is an advantage both for conducting experiments and, potentially, for predicting how well people might respond to vaccination or even to cell therapy. In this emerging treatment, the idea is to give back to a patient immune cells that are modulated in some way to restore the proper immune response. The Sharpe lab was also able to separate follicular helper T cells from follicular regulatory T cells, and show that by manipulating their balance they could control antibody production in a mouse. The ratio of follicular helper T cells to follicular regulator T cells is crucial and may explain why previous tests using mixtures of the cells did not yield clear results, said the paper’s first author, Peter Sage, a graduate student in Sharpe’s lab. “We can go back now and understand how the humoral immune system and antibody production work with what we know now,” he said. Humoral immunity refers to immunity involving antibodies in the blood. It appears that the ratio of these cells determines the effectiveness of vaccines. Patients who are older don’t respond as well as younger people to vaccination, perhaps because their balance of follicular helper T cells and follicular regulatory T cells has changed with age. Adding a protein that increases the helper-to-regulatory ratio might be one tactic to help stimulate early immune response, Sharpe said. “We may be able to rig the system, if you will, so you can get a better response to get better antibody protection,” she said. On the other side of the balance are autoimmune diseases, in which regulatory cells can no longer suppress helper cells, leading to a damaging attack on the body’s own cells. “Maybe there’s a therapeutic way to supply those follicular regulatory T cells that are missing in a way to treat systemic autoimmune disease,” Sage said. The paper describes how follicular helper and regulatory T cells are controlled by the PD-1 pathway, an inhibitory pathway that shuts down the response of certain immune cells when they are exhausted by the persistent barrage of chronic infection or malignancy. PD-1 has captured scientists’ attention because tumors and microbes hijack this inhibitory cell receptor to evade immune eradication, grow and survive. It turns out that the PD-1 pathway controls both the development and the suppression of follicular regulatory T cells. Much more work remains to be done to understand the role of these cells in health and disease. “This is really just the beginning of a whole new area of immunology because we have more questions than answers,” Sage said. This work was supported by National Institutes of Health grants T32 AI070085, R01 AI40614, P01 78897 and R37 AI38310.